The modern stage lighting industry is extremely changeable. The call for lighting techs goes up and down like a truss rigged on elastic, it’s what they call a flexible labour market. So, production companies rely on freelance technicians ( freelancers, freeloaders [insert term of abuse here]). Becoming a freelance lighting tech seems like a good deal from the outside and this article takes a look at what it takes to be a freelancer and the ups and downs of the self employed lighting technician. What does being a freelance lighting tech involve? Freelance technicians of all abilities are contracted on a temporary basis to take on different jobs within a lighting crew. While working on the production, they take on the “hat” of the company they are contracted to but are expected to be self-employed, pay their own taxes and run like any other small business. The tax authorities have some special measures the determines what is a contracted freelancer (not an employed temporary worker) but let’s not get into that today. Many shows have crews made up almost entirely of freelancers who then disperse after the production is complete. A Freelance lighting technician must, at least, have a good understanding of working practice in stage lighting. Being able to rig, focus and fault find are the minimum requirements with further skills such as lighting desk operation, roped access, electrical qualifications and other certificates being an advantage. The more wide ranging your skills, the better. And mobility. A driving license and a passport that isn’t down at the local police station means you can get to your next gig. The less tangible skills for a freelancer is the ability to get on with other people and work in teams, as well as being able to work unsupervised. Freelancing is awash with new faces and situations so being able to cope with pressure and change is a must. These are all vital “on the job”. What is less obvious are the personal skills that a successful freelancer needs away from the gig. Building up contacts and personal relationships within the industry helps get more freelance work. Good stage technical freelancers can come unstuck if they don’t possess good personal finance discipline. Being able to budget and control your own money is essential when you are working in such a precarious employment situation. Even if you have a good accountant, you still need to be in control. And some people just don’t like the thought of not knowing where the next pay cheque is coming from. There are some other requirements to “going freelance”. 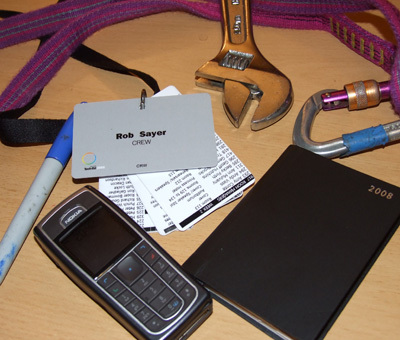 Self employed status, your own tools and transport, producing quotes and invoices etc. And insurance to indemnify yourself against any claim made against you in relation to your work. The good bits about being a stage lighting technician..
Travel – Planes, Trains and Automobiles…. And maybe some nice hotels. Time Off – When not directly on a gig.- No going “back to the office” after the gig is over. Daytime television, mmmmm! The bad bits about being a freelancer..
Work Flexibility – When you need work, you don’t get any choice which gigs you do or how they muck up your other plans. Travel – Endless hanging about at airports and being stuck in traffic on the motorway. And being away from your family. Meeting new people – Not everyone is a nice as you are. Time Off – There nothing like having no work in the diary for post-Christmas depression. So, can I make my first million as a freelance lighting technician? It’s unlikely. Many people think that being on a decent daily rate (how you charge for your time as a tech) means that you must be raking it in. The reason that freelancers “seem” to be paid so well is that is to compensate for the level of risk of being a self employed. Don’t forget that they have to pay tax, national insurance and other business costs too. And there is a limit to how much a freelance lighting tech can earn. There are only 365 days in a year – you do the math. Depending on your particular stage lighting business, it can be hard to fill up every day of the week. Gigs are often all on at the same time and you can only do one at a time (well, mostly). Having said that, being a freelancer is OK. I have spent nearly 15 years as a freelance “lampie”, LD and Production Manager. I have a house, kids and all the usual stuff. The family of a freelancer has to put up with a lot of instability in their lives too. But it’s just a job like any other. If you have any questions about being a freelance lighting technician, put them in the comment section below. If they say that “you’re only as good as your last gig” , let’s get on to the next one! So is freelancing the only decent way of making money as a lampie or is there ways of, say working for a company that sends you out on jobs with a anual sallery, or maybe working in a venue fulltime? You have picked out the three main ways to earn money as a lighting technician. They are all valid and suit different people. As a full time tech, the freelancers seem to be on a very high day rate. When you are full time, it doesn’t matter if you are in the office, or slogging your guts out on site – you get paid the same. Same can be said of some venue technician jobs. But what price do you put on knowing that you will be paid at the end of the month? Working full time for a company or venue you may get health cover, pensions, paid holiday and training/development paid for. You also get someone to “hold your hand” and let you make mistakes while learning the trade. Full time can be a great way to develop your skills. In the last 10 years, it has been the norm for full timers to do a few years with a company, then go out on their own (often still working for the same company as a freelancer). You don’t get any “benefits” as a freelancer. Every day that I am not on site, rigging kit, pressing buttons or working shows – I ain’t getting paid. I have always liked freelancing because I can see the direct correlation between how much I work and how much money I earn. I probably average 3 days a week (calculated over the whole year) and but still take home the same (or more) money as if I was full time. But it all comes in chunks. and some months of the year I will slog from gig to gig, hardly see my family. Looking at the last 8 months turnover, I am 6K down on the same period last year. If you asked full timers if they would like a pay cut like that, I know what the answer would be. Final thought – Nobody goes into stage lighting to really make money. The pay is not great compared to some other industries and it’s too much like hard work. And yet you do it, I look at things when im at colleage, connections and things, and i always come back to this. The pays not great but it has a some what lure to it. =/ maybe thats just me being strange. I’ve been trying to get some venue work for the last 6 months with no luck, simply for the insurrance and risks for being 17 .etc …but then again you got to start some where. How did you get started? I think i’ll probly go do a degree in lighting programing but i then think about it and see the cost of university, and then the income of a lampy to pay it off. You’re right to be worried about the cost of university. Not that you can’t earn enough money to pay it back, or that the course won’t benefit you. The thing that really winds us “old pros” up at the moment is the number of places teaching degrees in “lighting design” or “wagglylite programmer”. They do this, as commercial enterprises, because there is a demand for places on these stage lighting courses. This doesn’t mean that there is a lot of demand in the industry for graduates, or even a lot of vacant jobs in that field. Maybe that will change. The industry is still new and changing fast (just look at the old footage of music festivals in the ’70’s or the Staging/PA that the Beatles used in Shea Stadium). 30 years ago, the business was run by maverick individuals and mis-fits who made it up as they went along. That’s what is so great about it, you don’t need to explain to anyone in lighting about about the “lure” of working on shows. It either gets you or it doesn’t. I started as a casual in my local theatre at 16 (the youngest that you could be paid to work in a theatre). I got that gig because I had been in the Youth Theatre, learned technical stuff from the the pros and worked for free at the weekends. It’s not so easy now and our industry is growing up to have a more rigid training system where you must jump through the hoops. In contrast to the generation above me, I do have formal training (on the About page). This would have got me a place as an ASM or Assistant Electrician in a regional theatre when I graduated. But I went freelance instead. I know what you meen, I here that of are chief techy quite alot. The way i see it, the degree gives you the pieces of paper e.g ladders, electrics .etc and you’ve got some theory behind it. Dosent give you experience, i suspose somewhere slack on health and safety is where to learn. Im a technician and a manager but i still cant seem to make ends meet. Its not that good on the money. What is the going day rate for a Lighting Designer? The pay depends on a number of factors: Area of the industry (theatre, corporate events, concerts etc), level of expertise and what the term “lighting designer” actually means in any given job. Top end LD’s working on high profile events could earn up to £500 per day. LD for a small band – down to profit share or just expenses. Take your pick from anywhere in between. I saw that you are looking around for some LED array kit for your next show. Not sure if I can get some info out in time for you, but thanks for a good idea. I have thought about writing something in the the whole Media Server, LED array area. Keep the ideas coming, this site only exists to serve it’s purpose of helping you guys with what you want to know. My partner has just gone freelance and he’s finding it hard to get any work and it is only coming in through one company and it just isn’t enough. He is a very experience lampy and has been working in theatres and lighting shows since the age of 13years. any ideas on how we may be able to find him more work or how to go about finding him some. If you could help that would be brilliant. Sorry to hear that. There are a number of factors which have a hand in getting work as a freelance lighting tech. * Where you are based. Although a lot of lighting work involves travelling, if you live in London it’s a lot easier to keep yourself in work – rather than say the Outer Hebrides. * What area of the business you are in. My personal take is that it’s a lot easier to make a living doing corporate events, rather than theatre work. That sometimes means additional skills such as AV or sound. * Who you know. That old cliche. I have tried to get work from a “cold start” with different companies. More often than not, it is hard to get in. Once you are in, then as long as you are around the work keeps coming. I am still working with some of the same people that I knew when I was a kid. We’re just all doing different things in the business now. Freelancing is all about networking and it can seem like you are in a box, unable to expand past your horizon. It’s is not so much about your skills or experience – we’ve all got the same skills – those are taken as a given. So we are left with banging on doors, improving skills, changing tack and giving people who don’t know us a reason to try us out. HTH – You can email with any more details if you want a more personal answer – > About page. Just found your site and been reading with interest about going freelance in Stage Lighting. Hopefully it may be useful to you all, I have setup a site called http://www.freelanceadvisor.co.uk to provide every hint, tip and even podcast interview to help setup or do things better as a freelancer. Have a look and some of the self marketing and PR tips may certainly help you to get more work in. Some of the smaller summer festivals use students/volunteers to muck in but I wouldn’t say that this is great experience or even leads to bigger things. They just usually need cheap/free labour. Local “hump n bump” crewing agencies can also be a source of work if you’re fit and keen but these don’t usually lead on to better work on a lighting crew. So, reasonable sized lighting providers are a good start. You don’t need to be a fully fledged lampie, there’s opportunities for willing hands. I am 15 years old. I own a lot of stage equipment including moving heads, led and standard par cans, scanners, effects lights and a number of small to medium sound systems. I hire most of my equipment out to people for parties and have friends involved in bands and groups requiring equipment for gigs. I earn money for doing this but it is obviously not ‘millions’. If I were to carry this on in the future, what sort of path do you suggest I take? Going to university and taking courses in LD, stage management etc, or going for a standard electricians qualification. I have looked into going to RADA in London, is this a wise choice? Hi David. If you already have some equipment and are using it to earn, have you thought about doing some kind of business related course? Skills you learn in running a business are much more transferrable/marketable and could earn those millions. RADA and other stage managment courses are great at what they do – prepare you for work in theatre or related jobs. At drama school (Bristol Old Vic) I had a great time and learned new skills, the best of which were things like organisation and managing teams. It didn’t really prepare me for my current work/business or give me many options to step into something else. Only get an electrical qualification if you want to be an electrician. If a lighting employer needs you to have your C&G, they will train you. You can pick up stage lighting skills in better ways than taking a Lighting Design degree. Business skills could be learned early on, or you have to pick them up with age and experience. I wish I had known that when I was 15. I’m going to go into lighting professionally after finishing education. I have learned loads but was just wondering: How exactly do you get chosen as a freelancer to do jobs? for instance all music concerts in London venues – how do all the LDs and programmers get chosen for that job (the ones who dont work for the venues). Even if you are friendly with companies like PRG, what is it that clinches the deals and how might someone get enough work to build a reputation and progress to do bigger shows. Alex – “The work will come” is a good short answer with complex processes underneath. Your question has reminded me of an idea for an article on that very subject so I will get that finished and put it up soon. Thanks for your question – comments help to shape this site. BTW As Lighting Designer, the ideal is to have lighting companies working for you, not the other way around. Recently watched a show at the Palace Theatre in Manchester. Got me thinking about my love for theatre lighting which I gave up a while back! Any advice on courses etc?. Im 30 now so dunno if it would be worth it, suppose I should have stuck at it when I left school, got in as a casual at the Palace Theatre but left ( mainly due to parents gettin on my back to get regular income) , and apart from amatuer dramatics, never really found a way in. Any advice gratefully accepted, even if its ” dont bother”, lol. cheers!. Hi Anthony, thanks for your question. There are plenty of courses just waiting for the new intake of students keen on learning technical production and more springing up all the time. Way back when I was at drama school, we had some “mature” students who were starting again and following their dream. I think that having a passion for something and making a living from it are not always the same thing. I love playing the guitar but I wouldn’t want to make a career out of it. Do I still have the same passion for the business as when I started out as kid? Probably not, too busy hustling to the end of the gig so I can get the invoice in and move on. Just a thought. I am a GCSE student doing performing arts and I have been focusing on lighting as my main skill. I have found a lot of great information on your site. Obviously i’m an complete beginner so would you be able to answer a few questions for me? What qualifications do you need to get work as a lighting tech? What’s it like working with directors and actors? Do you have any advice for me as a next step after GCSEs? 1 – There realy aren’t any general rules regarding qualifications to work as a lighting tech. There are quite lot of useful threads at the Blue Room on the subject though. 3 – As I don’t really work much in theatres any more, I now have to work with the dreaded “clients” of the corporate world and musicians. We all need each other to make a good show. 4 – In the current situation, I would avoid going into the work environment for as long as possible. Being a student gives you freedom to learn and explore ideas. Whatever courses you decide to follow, keep your options open and carry on with lighting as a hobby to try to gain more experience. Hi i have found loads of great information on this website as i like many am a techie still in education. I know how many people struggle to get experience. I am 17 and my local theatre wont touch me. Fortunately my ex-stage management teacher gave me a contact that was looking for a cheap lampie. I was given a small brief and found out that i would be rigging and opping my first proffesional event last december at the strand theatre Euston. This just proves that there is work just keep searching for once your name starts moving between people more work starts to appear. Now that i have started getting more experience (On a very reduced wage but still) i am hoping to start a small production company for unsigned bands. I have the equipment and the staff i also have a market but am confused about insurance. Do i only need public liability or is there more. Insurance – As you are still under 18, I have a feeling that you will struggle to get PLI insurance. If you plan to have employees, you will also need employers liability and should get equipment insured too. Even working as a sole trader, the business side of things can get pretty complex if you are doing much more than providing your skill in return for a fee. Without some kind of proper legal entity and backup, doing your stuff for paying clients will come back and bite you if things go wrong. At your age, I would steer clear of the minefield and continue to work at what you love while employed by another business such as a theatre or lighting company. Hi Danni, as I said above “… £500 per day..down to profit share or just expenses. Take your pick from anywhere in between.”. You get paid what the industry thinks you are worth. Hi i’m doing a Foundation degree in Lighting Design in London. Its 5 days a week every day and part of that is an Electrical Installation course. I moved to London in September 2009 an I have never had so much before. My course is 90% practical and 10% theory all based around theatre lighting. I’m currently working as a Lighting Techy as well which is more than funding my course. As part of the course I do 5 weeks work placement which can be paid or unpaid this is just in the first year. I’m currently on the Casuals list in 3 London theatre’s which have paid me upto £40/hour on ‘get outs’. I would definitely agree to do a course in Lighting if you have little or no experience you only realise how little you know until you have someone ask you questions. I’m now earning enough to pay my fees and allow me to live in London comfortably but be prepared to work some stupid hours. But my main point is that there is some good courses out there but you only get out of them what you put in make sure the course is over 90% practical you learn nothing sitting behind a desk an make sure your prepared to make friends in the industry. What university are you at? Whats the name of the course? I’m at Wimbledon College of Art its part of University of the Arts London and the course is an FdA Lighting Design and Practice course. I would definitely recommend looking into it partly because it is in London and there is loads of work about in London and also because its a good course. But be prepared to work its long hours on the course and if you want to get the most out of it be prepared to be doing work placement at all different theatre’s around London in the evenings and weekends. Is problem for employers give job for me, if I haven`t go to any courses what is relevant with lights. I worked for 4 years with professional lights (I mean intelligent) and worked with avolite pearl(2000professional) as well. I have good skills working with sound and stage contractions. I think this is good bonus for employer. Thank you so much for this site It has given me a lot of things to think about. I am 41 and think I want to become a lighting tech. I’ll spare the long detailed explanation but it seems to combine creativity and technology which seems to make this square peg fit a round hole. I have been wondering if courses are really worth it for me I would I be better off trying to get in to a local theater and working my way up? I gather its tough getting in but when you are it becomes not easy as such but easier as you are in the right environment to network. Any advice that you could give would be welcome and if anyone with experience in the stevenage or london area has time for a face to face chat Id happily shout a few beers! So I’m 19 at the moment and I’ve been doing lighting for theatrical productions since I was 14-15, but I especially want to get into becoming an electrician or LD for concert venues or touring bands. I’m in college currently majoring for a degree in technical theatre but I specialize in lighting. Now I’m from the States and I was just hoping to get your insight into how i can go about getting started at a venue or maybe as an apprentice to a LD already touring or at a venue. I already know a lot about lighting but I’d love to figure out a way to just get my foot in the door, learn from someone who’s in the business and then be able to do it myself. I feel completely lost and have no idea how to go about getting started. Any help would be greatly appreciated. Hi, im doing a level 3 diploma in production arts at west herts college. going by what i’ve read it seems that i MAY be going the wrong way about getting “my foot in the door” as it were. the course covers everything! set designs&construction, ASM, DSM, LD, LX opp < sound design & opp , Production manager and Stage manager. Am i doing the right thing to have a couple of bits of paper with shiny stamps on it to get a reasonably decent job in theatre or should i have slogged my balls of as a free casual and worked my way up from the verry bottom? Also another question… if there's any other L.Ds on here that have done a version of a play named "the Whiz" could you sling some colour ideas over (lee filters preferably) and give some company names near hertfordshire for cheap wash moving head fixtures to hire? Hi, I am looking to get insurance for myself and for those who work for me on events, would you be able to suggest the best place to look for a good deal? I have been a light tech for only two years. i had no experience what so ever. i started work in animation in greece in a hotel. during this time i gained contacts then ended up working in egypt. i had no plan of where i was going. from day one i was being paid. so it goes to show that doing courses and going university don’t count for anything unless you have contacts. just general chit chat with a random can get you work. how hard is it to work for an actual band and tour with them? and design the light show? Hi, I’m doing a school research project about lighting technicians. Could you outline an average day on the job? I can’t seem to find anyone who can tell me about it. I know its not all lighting, but I don’t know hours or details. Could you give me a rough outline of the hours and stuff you do? Hiya Maggie. It totally depends on the specifics of the job: employed in a theatre, freelance concert touring, corporate events etc. Hours for the freelancer are 0800 to late, often some time the next morning on some jobs. Shows are usually evening times and setups happen before during the day. Employed technicians will work in their venues on particular shifts day to day. Their day might include maintenance or planning for the show coming in after. Working ‘on site’ as a freelancer, you’ll usually just be setting up for that particular show. Lots of shows are setup, performed and removed in the same 24 hr period. For specifics of different technicians’ daily activities or hours, ask around at the Blue Room Technical Forums or search for some answers – your question has probably been answered before.